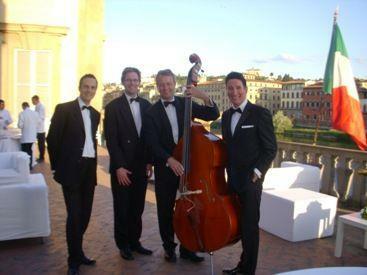 Why not have a Jazz Band,Swing Band or Rat Pack Band booked by stars at your event? We supply any size of band and all our musicians are drawn from the cream of British Jazz musicians and are lead by international swing/jazz & rat pack singer Kevin Fitzsimmons, who\'s widely acknowledged as being one of the country’s top performers in this genre of music. Our clients incl. royalty, showbiz & sports stars, prestige brands & global corporations, and our popularity at weddings, corporate events and parties throughout the U.K. & abroad is due to competitive fees for outstanding entertainment, combined with our impeccable reputation within the industry. See website for full details inc. live recorded demos, videos, references etc.